OMG Posters! 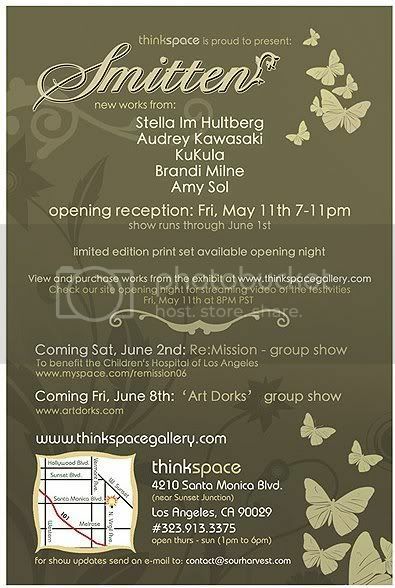 » Archive Smitten Show at Thinkspace Gallery Posted - OMG Posters! “Smitten”, Thinkspace Gallery’s amazing group show featuring Amy Sol, Audrey Kawasaki, Stella Im Hultberg, KuKula, and Brandi Milne, has just been posted online. Many of the pieces have sold already, but there are still a few available. Also, word is Thinkspace released a 5 print set at the show for only $250. To inquire about any leftover copies, email Thinkspace. To see the show, Click Here. Enjoy! e-mailed thinkspace, and they informed me that they are all out of the 5-set prints. but the word is (as they have told me) that they’ll have individual prints from audrey and stella in the near future!